Major Ontario varieties are Summer Crookneck, Pattypan, Vegetable Marrow and Zucchini. One half cup of cooked summer squash contains 16 calories, 1 gram of protein, 3 grams of carbohydrates, some vitamin A and C, and some fibre. It is generally accepted that C. pepo is native to the Americas. Remains have been found in Central America and Mexico dating back as far as 7000 BC. 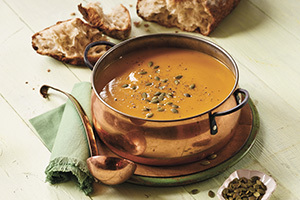 From its southern origin, squash spread throughout North America. The name squash is apparently derived from the Algonquin "askoot asquash," meaning "eaten green." The plant found its way to Europe when the early explorers returned home. Summer squash have a very mild, nutty taste, sometimes resembling fresh corn. In addition, immature winter squashes, such as the acorn, can be eaten like summer squashes while they are still very tender. Summer crooknecks are yellow and usually have a smooth skin. Some have a pebbled texture and some have no crook at all. English vegetable marrows are cylindrical and blunt with greenish flesh and pale green skin which turns to white at maturity. Italian marrows, called cocozelle are similar in size, shape, and colour, but are striped. Pattypans are also called Peter Pans, scallops and scallopini. In the southern United States, they are known as simlins, symblings or cymlings. They are rounded, like flattened spheres, and very attractive with their fluted or scalloped shape. Their colour ranges from a creamy white to a pale green. Zucchini is undoubtedly the most prevalent (and prolific) summer squash. It is usually dark green, often has longitudinal stripes of lighter green, and occasionally is yellow with green stripes. If left to maturity, these vegetables will grow very large, but they are at their best when young and tender. Choose them small and firm, with bright colour and no bruises or soft spots, particularly at the stem end. 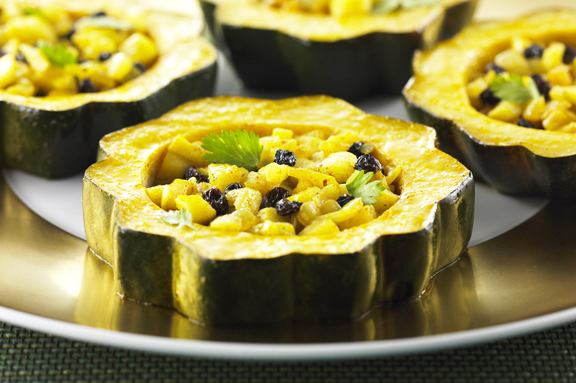 Pattypans should be 5 cm across; yellow squashes, marrows and zucchini up to 15 cm long. Their tender skin bruises easily, so handle with care. Store in the refrigerator for up to five days, wrapped in plastic to protect from drying. Summer squash can be eaten raw; grated or sliced in salads, or sliced and served on a plate of crudities with dip. Grated zucchini is often an ingredient in muffins or quick breads. The taste and texture of summer squash is perhaps best appreciated lightly steamed or simmered in butter. Summer squashes can be left whole, large ones cut in 1 cm slices. Cook about five minutes, until tender crisp, and top with fresh herbs (chives, dill, parsley, thyme,) salt and pepper. Combined with other fresh vegetables and lightly sautéed in olive oil with garlic, fresh basil and oregano, summer squash adds an interesting taste and texture to a prima vera topping for pasta, along with grated Parmesan cheese. Sliced in half lengthways, zucchini or yellow squash can be barbecued until tender crisp, and topped with basil pesto. Small (6 cm) squashes can be cooked with their flowers still attached. Sliced along their length, but left attached at the stem, the tiny zucchini are fanned decoratively and the flowers filled with a savoury mousse. Very large summer squash can be scooped out, filled with stuffing, and baked until tender.